Happy Independence Day from Weave! To date, Weave Magazine has sold 22 subscriptions this month - only 8 more to go to reach our goal! If you haven't gotten a subscription already, you should while the prices are still discounted! Don't forget - we'll thank you right here on our website. A big thank you to the following Weave Magazine subscribers! You can still get your subscription at the discounted rate of just $12 until June 30th! 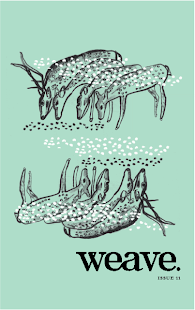 While you are at it, you can pick up issue 01 for just $7. Three issues for less than $20 - now that's a deal! We here at Weave continue to be grateful for all the support we've received during the first half of our subscription drive. To date, we have sold 15 subscriptions! Half way there! If you still have not subscribed please support Weave and independent publishing with your subscription today. Thank you in advance and we look forward to thanking you publicly here on our blog next week! PS: If you don't want to buy a subscription online email us at weavezine@gmail.com for info on mailing a check or money order! Author David Berner discusses and signs his novel Accidental Lessons. featuring readings and talk show chatting with S.E. Smith! her story collection, "The Wild Girl of Western Pennsylvania,"
spectacular appearance from Drive By Drag. Weave Magazine is pleased to announce a very successful start to our subscription drive. During just the first week, our supporters have purchased 9 subscriptions! - Two issues of Weave Magazine! - A public Thank You on our blog, including a link to your website! - That warm fuzzy feeling when you support a good cause! Please help us thank these lovely people by visiting their websites! 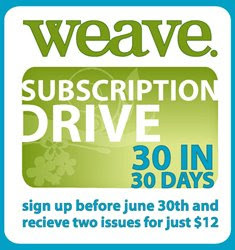 Support Weave today by SUBSCRIBING TODAY! "After the (amazing) scantily clad, mildly orgiastic debacle that was The TypewriterGirls Try Drag, the ladies have decided to turn over a new leaf and begin an epic battle in the name of social justice. Join them in their quest to unionize the Greater Pittsburgh bohemian community–streetwalkers, poets, bicyclists, tarot card readers, amateur astrologers, and the like–while revolutionizing Pittsburgh’s concept of 'employed.' Supported by the AFL-CIO (in a manner of speaking), The TypewriterGirls have rounded up an all-star team of Grass Roots Community Organizers to aid them in their cause." Feat. poets Renee Alberts, Adam Atkinson, Mary Biddinger, and Jay Robinson, with music by Between Liberties, DJ Randy Spinster, escape artistry by Dave Doyle (aka Pester the Jester), and punk rock burlesque with Shrimp Scanty. feat. Judith Dorian, Roberta Hatcher, Gene Hirsch, and Paul Zdrale Jr.
of faith and sexuality in the GLBT community.